We did this theme last March, and I used a real Mardi Gras Indian outfit without much success. Looking at it now, I understand why. 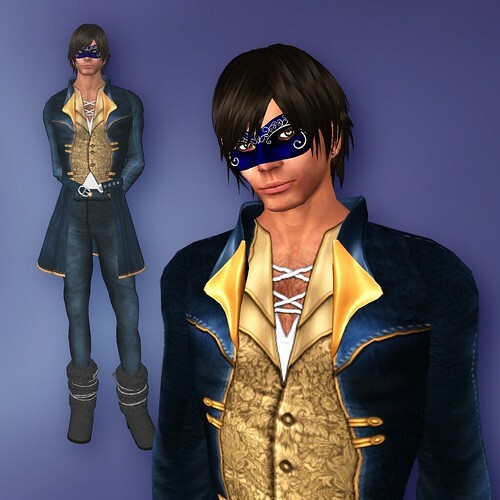 I took my own advice from then and went with something less authentic and more stereotype, picking the piratey goodness of a Jeanne LaFitte look and – since it really only needs a mask to be Mardi Gras – added the great Columbia Veniza from Illusions, colored blue and gold to match. I did not find a great pair of boots in my inventory. The outfit really called for a pair of SF Designs Slouch Boots and someday I’ll own a pair, but for the contest, I was too cheap to buy a pair. None of my other boots had the right feel but the Make Him Over Hunt treasures included the Wrap Boots from Frock You. They weren’t exactly piratey, but they had a kind of costume feel and they looked ok. Note to Frock You: the boot tops are No-Mod and there’s no resize script. Fitting them on my almost 8foot frame was impossible. I wound up having to turn them upside down to get them even close. Ultimately it worked. I was shocked to be named in a tie for third. It was a small field and I was more than a bit surprised that I tied for third place. Xenobia Foxclaw’s Lady Pirate costume was brilliantly executed and I was basically scraping thru my inventory. Poses. The prim tails on this coat made pose picking much more of a challenge than normal. Different avatar. King Neptune would have been good. So would Bacchus. Posted on July 23, 2009, in Contests. Bookmark the permalink. Leave a comment.